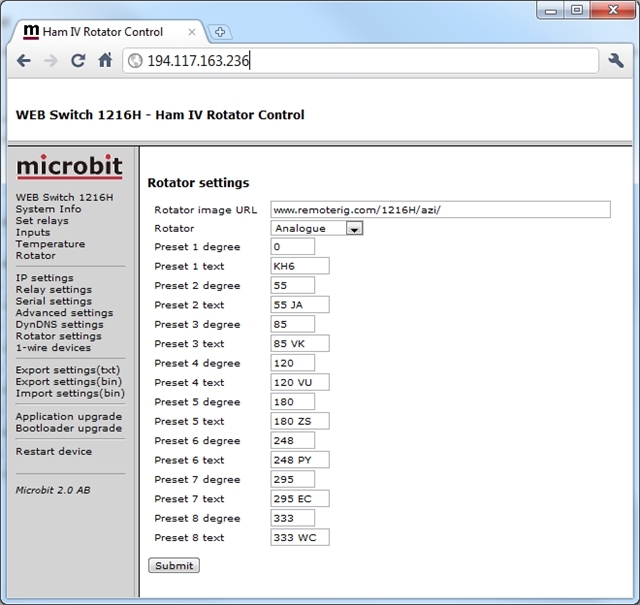 To setup a web based rotator control for a analog rotator, the Rotator control Unit (RCU) is connected to the Webswitch 1216H. 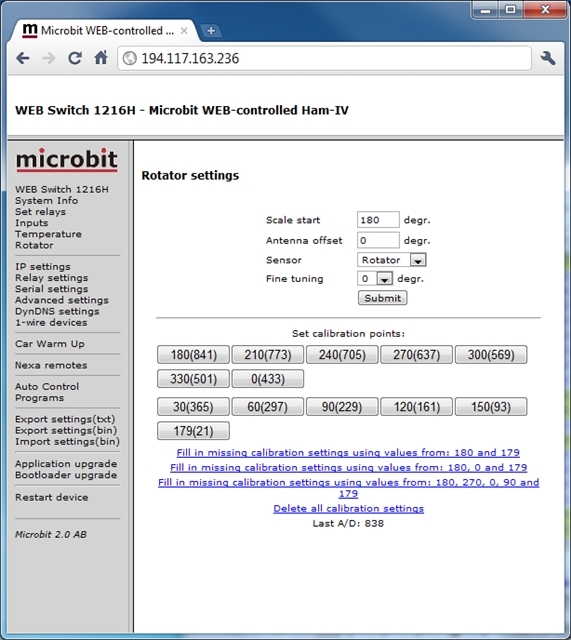 The RCU is connected via the 1-wire bus to the webswitch. 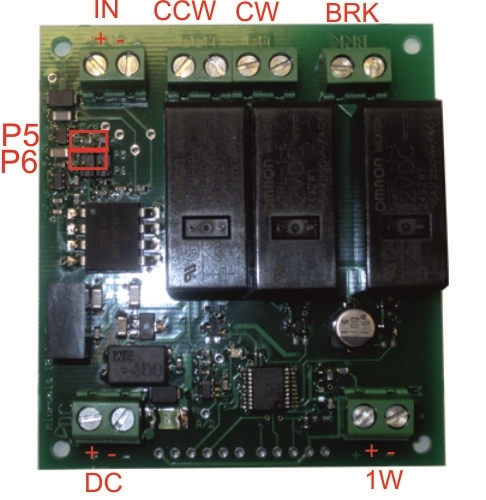 The RCU has three 16A relays for CW and CCW rotation and for brake control. For the the azimuth (direction) reading there is A/D input which handles 0-16V. The A/D input is fully isolated. The RCU can be connected to most of the current available rotators and rotating tower controls. The indicator can be calibrated every 30 degrees to handle potentiometers which is not linear. 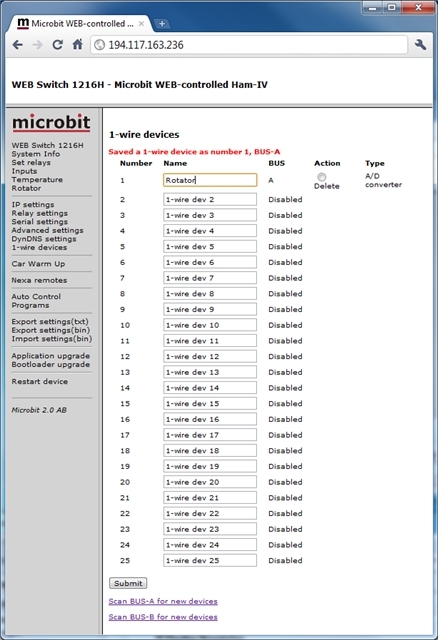 When using the Webswitch and the RCU you do not need to use the RRC-serial ports for rotator control. The Rotor Control Unit 1216L (RCU) is connected between the Webswitch 1216H and the Rotator Control box. 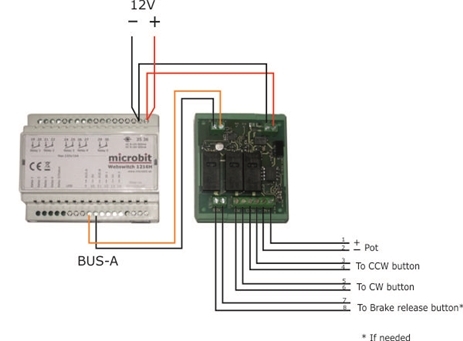 The RCU needs 12V power, an easy way is to connect it in parallel with the power to the Webswitch. Note! If you connect 12V to the Webswitch via the circular 2.1/5.5 mm DC-connector, + must be in the center. The RCU gets it’s control signal trough the 1-wire bus from the Webswitch, Bus A connection must be used. The Pot (A/D) input is connected in way that it will sense a Voltage between 0-16V depending on the direction of the Antenna. RCU:s from version 5 has three input ranges 0-2.5, 0-6,5 and 0-16V which is selectable with jumpers ( see below). To get maxium resolution select the range which best fits your rotator. There are calibrations points at every 30 degrees so the input voltage do not have to be 100% linear. The input Impedance is >220K so it can be connected almost everywhere. The Pot Input is fully issolated from Ground. Note. 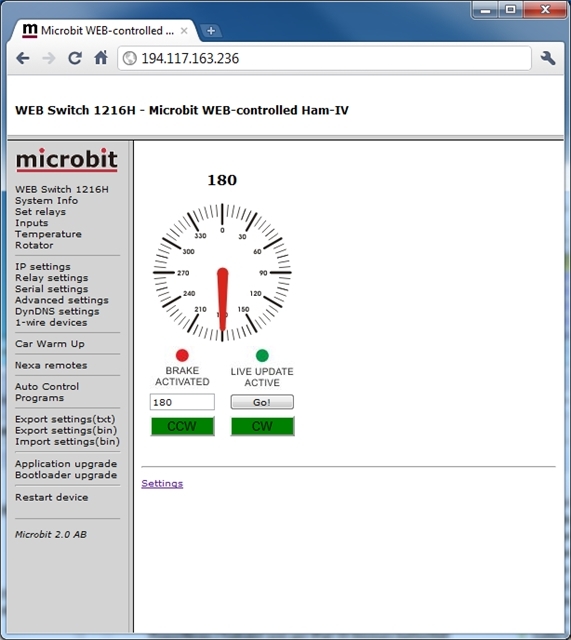 When you power on the the Webswitch and the RCU-1216L-5 the LED on the 1216L-5 will blink fast 10-12 times then it will stop blinking until the webswitch is setup to communicate with it. 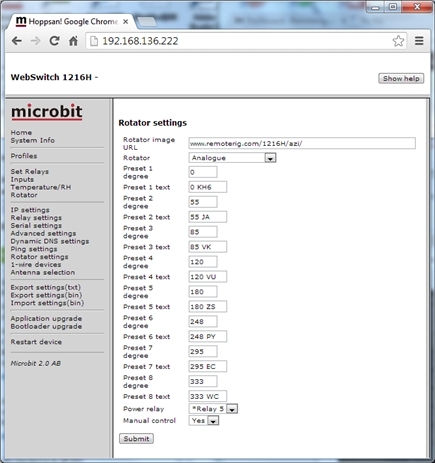 When all is setup and the Webswitch and the RCU-1216 are communicating the LED will blink about once per second. Attention! If you connect the RCU to a HAM or CDE rotator remember that the break release button is connected on the primary side of the transformer. The RCU handles 230V but you have to be careful when doing the installation, keep the protection cover on the back of the PCB and mount the RCU inside the rotator control box where it cannot be touched by accident. Before you can use the Rotator control unit 1216L, there is a few steps which have to be done. First do the hardware installation, after that do the following. 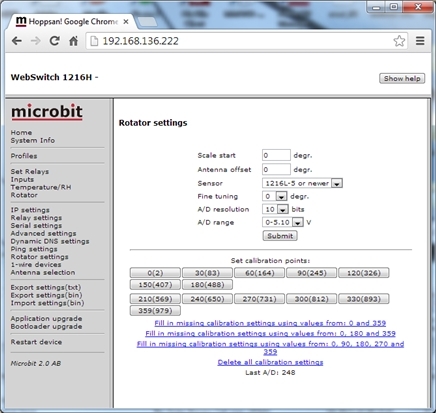 Browse to the Webswitch 1216H, and select the “Rotator Settings” link at the menu to the left. Set rotator to “Analogue” and press the “Submit” button. Later on you can program the Presets here, I think it’s quite intuitive. 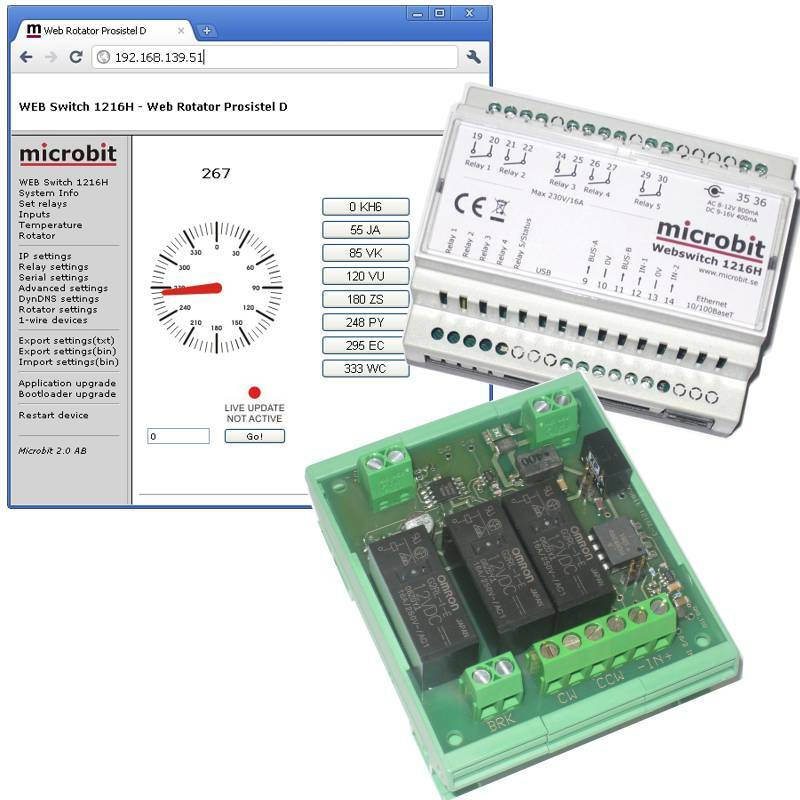 If you have a earlier version of the Rotar control unit eg. 1216L-3 or 1216L-4 see end of page. Now select the “Rotator” link at the menu to the left. Then press the “Settings” link. You will now see the Rotator settings window. Enter “Scale start” value, If your indicator scale starts from 0 set 0, if it’s 180 set 180. If your antenna is not mounted exactly according to the indicator you can set an “Antenna Offset” value. Check that sensor is set to “1216L-5 or never”. (If you have a 1216L-3 or 1216L-4 select the sensor you scanned and renamed before). The “Fine tuning” can be used if the antenna will go to short or to long when used fixed values, leave it at 0. From your ordinary Rotator control box turn the antenna fully Counter Clock Wise (CCW). Press the first button “0” or “180” ( depending on where your scale starts) to learn the RCU A/D value indicating antenna fully CCW. From your ordinary Rotator control box turn the antenna fully Clock Wise (CW). The A/D value on the bottom of the page will Increase or decrease now. When its fully CW, press the last button “360” or “180” ( depending on where your scale starts) to learn the RCU A/D value indicating antenna fully CW. If your rotor indictor potentiometer is linear the settings are done now. Now select the “Rotator” link at the menu to the left again. Now test to rotate the antenna with the ordinary control box and compare the direction on the control box and the “Web” values. If they follow each other the Potentiometer in the rotor is fairly linear an everything is OK. If the pot is not linear you can set the values manually buy pressing the calibration points buttons. When the setup is done you only need the rotator window in the future. It’s quite Intuitive I think. You can turn the antenna CW or CCW manually by pressing and hold the CW or CCW buttons. The buttons vill change from green to red when the rotator is turning the antenna. The “Brake Released/Activated” LED will indicate when the brake is released, It will be released a moment before the rotation is started and activated a few seconds after the rotation has stopped. The “Live Update Active/Not Active” will indicate if the window is showing Live values, It will change to “Live Not Active” after about 30 seconds of no activity. You can enter 8 directions with a label. With the power relay setting you can decide which of the 5 relays you want to control from the “Power On ” button. If you do not use it set it to “Disabled”. The Manual control buttons “CW” and “CCW” can be disabled so they will not show up on the Rotator page. The CW/CCW buttons are not 100% supported by smartphone browsers for example, so it can be safer to not allow use of them by setting “Manual Control” to No. Select the 1-wire link at the menu to the left. Then press “Scan BUS-A or B for new devices” depending on which bus you have connected the RCU 1216L to. If everything is OK the Webswitch will indicate that it has found a A/D converter eg the RCU 1216L. You can now change the name to something which is easier to recognize, for example Rotator. The press the “Submit” button.